Row 1: P1, k2, p1, k6, p1, k2, p1. Row 2 and all WS rows: K1, p2, k1, p6, k1, p2, k1. Row 3: P1, right twist (skip 1st st, knit into the front of second st, knit skipped st, and slide both sts off needle), p1, k6, p1, left twist (skip 1st st, knit into the back of second st, knit skipped st through the back loop, and slide both sts off needle), p1. Row 5: rep Row 1. Repeat rows 1-6 once more (for 2 repeats and a total of twelve rows). Row 13: rep row 3. Row 15: rep row 1. Row 17: rep row 3. Row 19: k2tog across. Cut yarn, leaving about 12 inches. Weave end through remaining 7 sts and pull tight. To finish, fold cast-on row in half and sew closed (this is the heel), then sew up 2 to 2.5 inches of the edges at the toe end. Weave in all ends. To reiterate, the pattern for the slippers that inspired these is here. This entry was posted in Finished, Patterns. Awww, the slippers looks so cute minaturized. Hi – It’s Mom – I appreciated seeing your list. I remember even as young as when I was in Japan the missing of current shows, and being able read and understand the world around me. But what are the ten things you love about being in Japan? Is it what you hoped for – adventure and excitement? Love Mom. Hi, I found your site and had to comment what a cute header you have – it is so bright and cheery. Is the original adult pattern available? I’d really like to make these for a ladies’ foot. 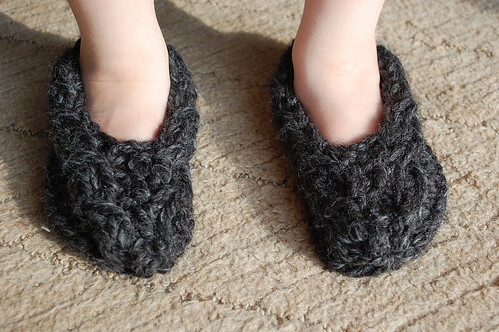 You can find the adult slipper pattern here! How would I change this pattern to accommodate my boys’ feet which are 19cm or 7.5″. My boys are 7 and wear a size 2 shoe I think. They have to take their shoes off at school so this would be great to keep their feet warm this winter. Thanks! Hi there, Melissa. I’m intrigued by your variety of interests, along with simply being courageous enough to pursue them with your built-in basketball team gathered round home-schooling. I’m a former teacher, but I’m not sure our acronymns match. OUt of curiousity What’s LDS? I haven’t made many sweaters, vests, or afghans, but I always recommend Knitting Pattern Central for free patterns. It’s one of the biggest directories of free knitting patterns on the internet. As far as a source of good, inexpensive yarn goes, I think we’d all like to find that!